Commack’s Steven Vasile wins discus with a personal best toss. CICERO, N.Y. — The Penn State track and field incoming freshman group chat was eerily quiet this week. The flowing text conversation that is normally filled with the hope and excitement of new beginnings took a break for one last bit of competitive spirit. 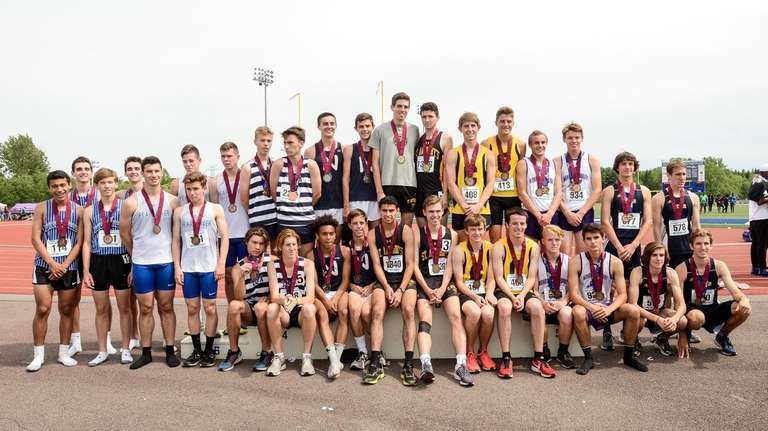 Two of its members, soon to be teammates Elijah Claiborne of Northport and Ben Bulkeley of upstate Fairport, were set to compete in the state championship of the 800 meters at the end of the week and no one wanted to give an inch of edge. 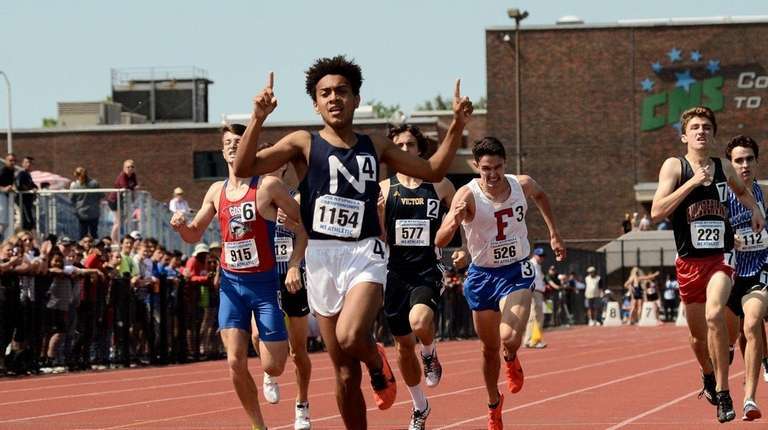 Barely an inch was given throughout the extremely close race but, in the end, it was Claiborne who got the best of Bulkeley and brought home yet another state championship to Northport, one of the best distance programs on Long Island, regardless of season. Claiborne won in 1 minute, 52.33 seconds on a warm, sunny afternoon at Cicero-North Syracuse High School Friday, the first day of the state championships. Claiborne, who beat Bulkeley en route to a second-place finish in the 800 at the Loucks Games last month, dropped into third place with 300 meters to go before a quick kick lifted him into first with about 250 meters to go. Goshen’s Liam Higgins moved into second on the final lap and finished in 1:53.25. Bulkeley was third in 1:53.41. Claiborne said he didn’t take too much comfort in the fact that he beat Bulkeley at Loucks, knowing it would be more difficult with even more on the line. “I only beat him [at Loucks] because I had the lead on him in the beginning,” Claiborne said. “So, I knew I had to do it again at this meet to beat him. There won’t be too much racing against each other come summer. That fact wasn’t lost on Claiborne, who can’t wait to team up with Bulkeley on what should be a strong Penn State middle-distance unit next season. “Running against him in that final 200, I know that our team next year at Penn State is going to be pretty good,” Claiborne said. Long Islanders also had an impressive afternoon in the field. Commack’s Steven Vasile won the Division I discus, throwing 174 feet, 9 inches. The toss is a personal best by well over a foot, he said, and qualified Vasile for the New Balance Outdoor Nationals, scheduled for June 15-17 in Greensboro, North Carolina. On Saturday, Vasile will compete in the Federation discus toss, which encompasses all schools regardless of size or classification. Vasile said he needed to hit 174 feet to move into the championship section of the talented field at New Balance Outdoor Nationals. Southampton’s Sebastian Pereira won the Division II triple jump, flying 49-1 3⁄4 and Uniondale’s Jadan Hanson was second in the Division I triple jump, going 49-3 1⁄4. Pereira also finished second in the Division II long jump with a leap of 22-11 1⁄2.